- Serious trekking with some rock scrambling. 4-8 hours average day covers between 7 and 16 kilometres. You must bring yourown cooking equipment. Fly to Durban/Pitermaritzburg, transfer to Monte-Aux-Sources. In addition to the basic equipment list please view the hiking list and the Extreme list. This trek is from Monte-Aux-Sources in the most northern area of the Drakensberg, south to Cathedral Peak. It traverses the high escarpment of the range and normally takes 5-6 six days to complete. Accommodation is both in small mountain tents and demarcated caves. 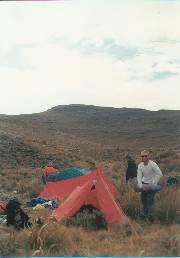 Caves or rather rock overhangs have long been used by South African hikers and climbers as a useful alternative to using tents. All guiding and climbing is done by Gavin Raubenheimer who is registered with the South African Department of Environmental Affairs and Tourism (D.E.A.T) and is a certified Mountain Guide (SAMGA) and Mountaineering Instructor (MDT). He has been guiding since 1992 and has experience in the Andes, Morocco, Scotland, Wales, Canadian Rockies, French Alps, Mt. Kenya and all over southern Africa. These trips are not done in the style of Himalayan treks with porters, cooks etc. Parties usually consist of the guide and one to four clients and are organised on demand and not at set times. Clients need to be reasonably fit and able to walk carrying their own backpack. NB: You will need a valid passport because of the proximity of the Lesotho border. Price includes: Guide only. You will need to provide all own equipment, food, tent etc. Day 1:(6km)The start of the trip is from the Witsieshoek car park (2500m), from where one climbs for two hours up to the escarpment. This is a 6 kilometre hike on a good path. At the 4 kilometre mark there is a chain ladder that has to be climbed. (The chain ladder can be avoided by ascending a gully.) From the top of the chain ladder the path turns south to the high plateau which forms the famous Monte-Aux-Sources Amphitheatre. This first night is usually spent in an old hut on top of the Amphitheatre . Day 2: (15km)In the morning one can watch the sun rise over edge of the Amphitheatre. From there the route hugs the escarpment edge for the next 15 kilometres at an approximate altitude of 3000m or 10000ft. To the east the landscape drops away dramatically into the KwaZulu-Natal Province of South Africa. To the west are rolling mountains of the small land-locked Kingdom of Lesotho. The area to the east is called the Mweni and is perhaps the most spectacular area of the whole range. Most of the rest of the trip is spent walking along this high plateau. Camp in tents at the summit of Fangs Pass. Day 3: (15km)This day starts with a long 2 hour climb (6kms) around the "Mweni cutback" (3212m, highest point of trek) and then a gradual down hill for 9 kilometres to Ledgers Cave. This cave has one of the best views in the entire range, as it is perched right on the edge of the escarpment. Day 4: (16)An easy walk up past the huge rock peak of "Mponjwana" and then a gradual climb up and over the "Saddle ridge" to Twins cave. Another spectacular view awaits. Total distance of 16kilometers. Day 5: (11 km)From Twins cave (2800m ) we descend Mlambonjwa Pass to Cathedral Peak Hotel and the end point at 1400m. Total distance 11 kilometres. Alternative routeDepending on time and fitness of the clients the last 1.5 days can incorporate doing the "Bell Twins Traverse" and ascending Cathedral Peak itsself. The route is very spectacular but clients must have a good head for heights as the are steep drop offs below the path. Cathedral Peak (3004m or 9856 ft) is summitted by a one hour long scramble.